Lovely homemade birthday cards by Valerie Smith! 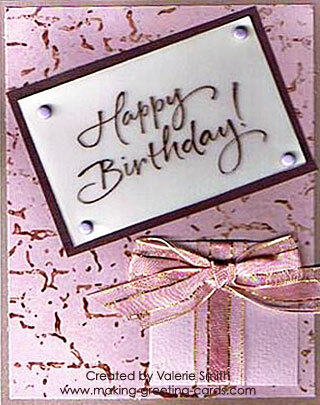 Each of these birthday cards were created with much care and love for family members and friends. 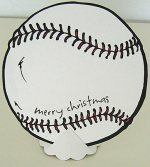 I have been a happy recipient of Valerie's handmade cards; birthday, christmas and everyday cards. She's a real caring person with a BIG heart. I will be dedicating one whole page to the cards that Valerie made specially for me. They are all kept in a special box with handmade creations by others and taken out to view often with gladness and for inspiration. Thank you, Valerie for all your cards and the encouraging message inside each card. Love them! You are an encourager. 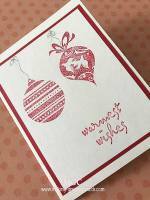 To view more handmade cards by Valerie, just scroll to the bottom of page and click on the relevant links. 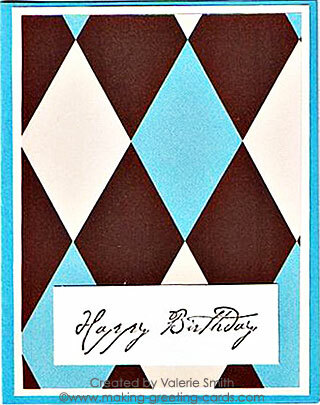 Simple happy birthday card with pattern paper (or are the diamonds pieced together?) and rubber stamp. The colour combination is just so cool. 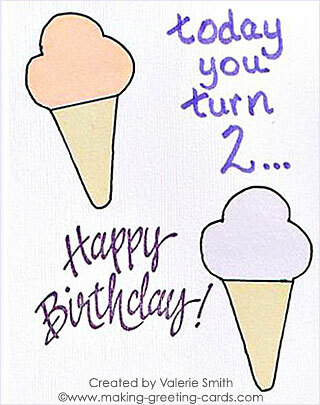 A happy birthday card for a child who has just turns two. I love the ice-cream cones - makes me want an ice-cream too. 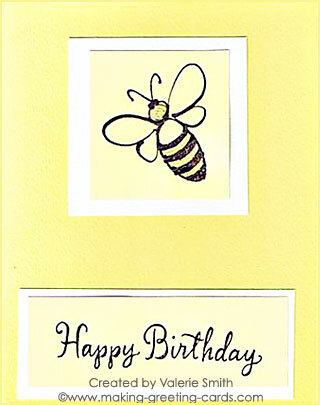 Here's another handmade greeting card using a bee rubber stamp image. Bright spring or summer card - can also use this as a Get Well card design. Love the colour! Thinking of You - Have a Great Birthday! Celebrating someone's birthday with this lovely homemade card. And more birthday cards by Valerie Smith. 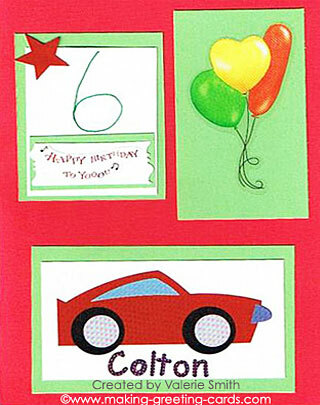 Happy Birthday To You, Colton! A birthday card for a six year old boy. 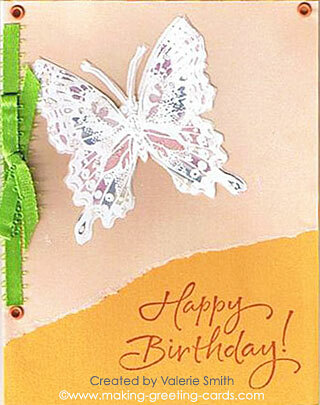 Sending Happy Birthday wishes with butterfly and ribbon. 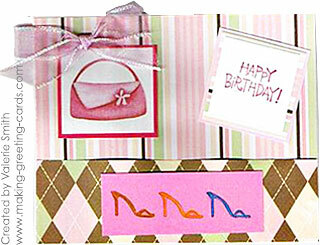 A fashionable birthday card with rubber stamped handbag and shoes. A lovely birthday card for someone young or young at heart. The parcel and the pink ribbon just go together so well. 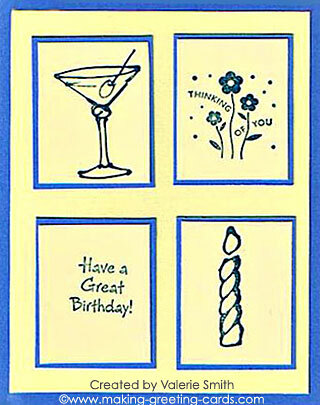 When there's more birthday cards by Valerie Smith and she sent in more of her cards, I will add them to this page. 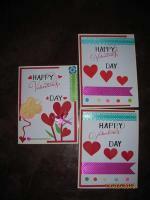 So look out or bookmark this page if you are friends of Valerie or love her card making style. 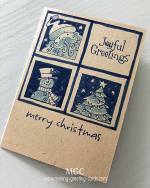 If you want to add your handmade cards and would like to have a page dedicated to all your handmade greeting cards, let me know and I will get one page like this up for you.